This guide was co-written by Jay Baer and Convince & Convert Strategist, Anthony Helmstetter. To work through this process, download this Excel worksheet. 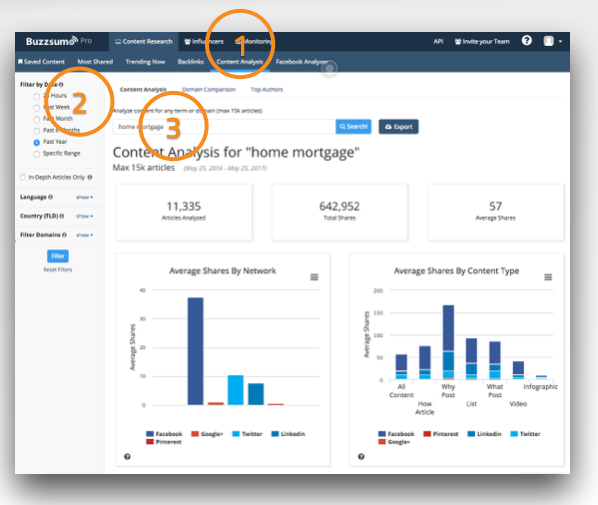 In previous blog posts, we’ve covered how to identify content assets and gaps, based on the most important persona questions. We’ve covered the 5x5x5 questions and content gap analysis and the roles of “bricks and feathers” and Youtility content. 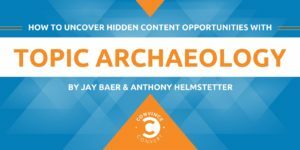 Here, we’re going to show you a process for uncovering hidden content opportunities: somewhat less obvious topics of interest to your audiences that don’t fit into the processes linked above. We want to prioritize these “hidden” content opportunities based as much as possible on actual data. But where does that come from? Where do we get new ideas for content our audiences will love? 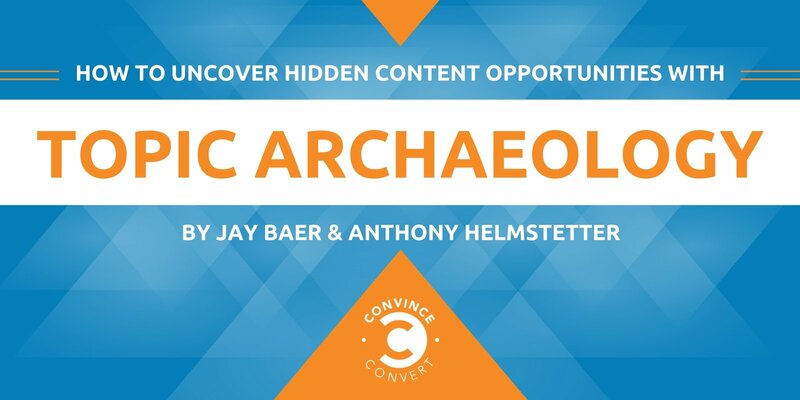 Topic archaeology is a process we have used at Convince & Convert for clients all over the world. We like it because it uses data from organic search and social chatter to identify topics people actually seek and discuss. What Is Topic Archaeology, and Why Is It So Important? Topic archaeology uses a data-driven method to unearth, uncover, and identify topics relevant to your potential audiences. The process has four parts: topical seeds, keyword research, social listening, and scoring and ranking. The first part is your topic intuition. Identify 20 relevant topics within your key audience segments that are not well covered by the 5x5x5 questions process. These should be topics that you have not thoroughly covered in your existing content. Put these 20 seed topics in a spreadsheet. 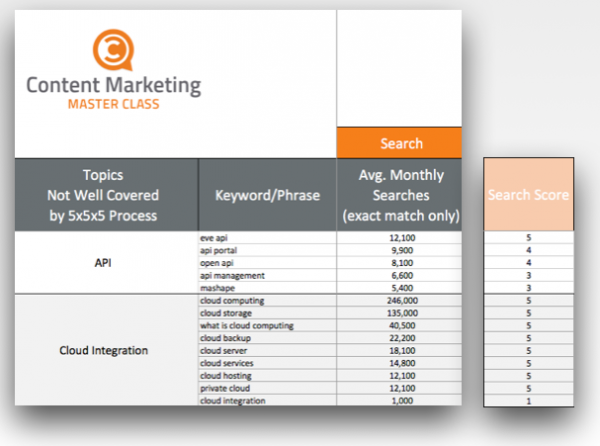 Query your list of topics in a keyword research tool of your choosing. Select relevant suggestions, permutations, and adjacent topics as candidate phrases. You can use Google Keyword Planner which resides within Google Analytics. 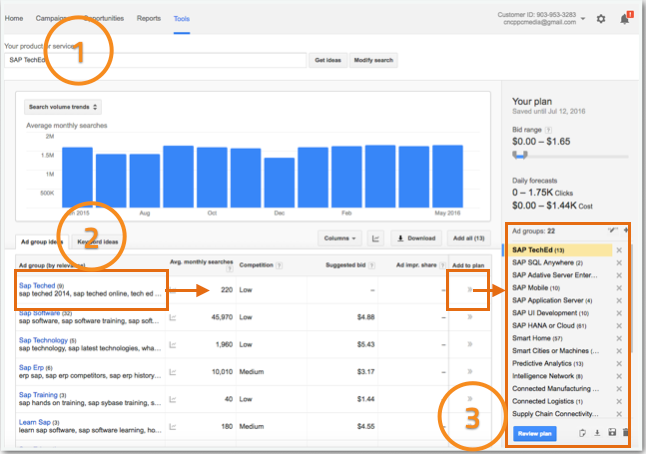 Note: To use Google’s Keyword Planner, you must have a Google analytics account, and you must have an active Google paid search campaign set up to access the full details of search volume. This is important because otherwise, all you have access to are low/medium/high labels rather than the actual average monthly search volume numbers. For purposes of this exercise, it is important to have actual monthly search volume. If you do not have a Google Analytics account and a Google paid search account, you can easily set one. To have an active pay-per-click account in Google, you’ll need to provide your credit card for the campaign—however, you do not have to turn the campaign on. Hence, no credit card charges. Once you have access to your account, go to Tools, and select Keyword Planner from the drop-down list. Insert your first topic, and select Get Ideas. Review the related topics and the search volume for each and select the most desired, relevant topics. Add at least five different, related terms and phrases and select Add to Plan move them into an ad group; if they’re not relevant, don’t add them. Repeat this process with each of your 20 seed topics. When you’re done, export your new list with accompanying data as a .csv file. As an alternative, you can use KeywordSpy, which offers a free trial and does not require a credit card. If you chose to use KeywordSpy instead, you essentially repeat the same steps described above. Enter a seed topic, get ideas, select relevant candidate phrases, and export the list as a .csv file. So, if you already have a Google account, use that. If you don’t, it’s probably a little faster and easier to use KeywordSpy. Next, we want to measure social media chatter for your topics. If you already have a social listening tool that allows you to access social mentions by topic—not by post type—use it. There are many social media listening packages that allow that, and if you have access to one, use what you already have. If not, BuzzSumo is terrific for this process and a number of other things as well. They offer a 14-day free trial with no credit card required to subscribe, and it’s only $99 per month for the Pro version. Let’s assume you set up a free trial and follow these steps. From the BuzzSumo dashboard, click on the Content Analysis tab in the top menu bar. Next, filter by 30-day time frame located in the left-hand column. If your business is seasonal, perhaps super busy in one particular quarter, or if over a 30-day filter period you just don’t have very much social chatter for a particular topic, set your filter to the past year instead of 30-days. Play with that and adjust accordingly, but keep the filter the same for all your key phrases. 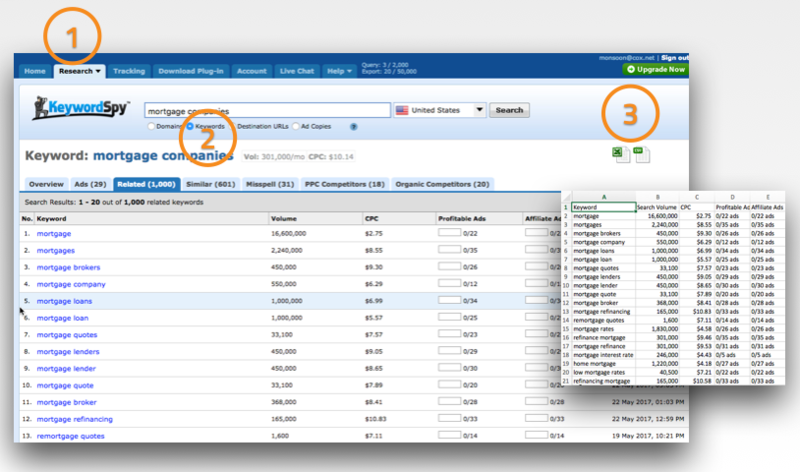 Take each of your keywords and phrases, and one at a time, enter them in and click on Search. Interesting things happen now. 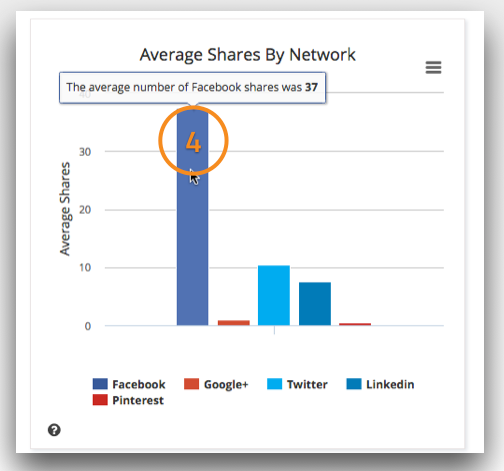 BuzzSumo will show you an Average Shares by Network chart which shows you how many times that topic was shared in social media. Takes each of those numbers and add them into your worksheet. Just as with your search data, when you paste the numbers into the spreadsheet, they will automatically be given a relative score from one to five. This may take you a little bit of time depending on how many phrases you have in your spreadsheet, but it’s a pretty process. At this point, your worksheet has keywords and phrases, search volume, social volume, and a rating score for both search and social. Quick sidebar: You may not get Facebook data because of the way Facebook runs their API. Don’t worry about that because this is for comparative purposes only. Some social listening tools will measure social “shares,” and others will measure social “mentions.” They’re different behaviors, of course, but for purposes of this analysis, it doesn’t matter. Either is a proxy for popularity which is a social media measure for search volume. Just be consistent across the whole spreadsheet. In the last step in this process, the worksheet has combined the search and social ranking scores to give you a cumulative score between two and 10 (two being lowest popularity, 10 being highest popularity). You can see in the example there are several topics with eights and nines, and even a 10. What we would do next is select all the eights, nines, and tens, take those topics, and get them into your upcoming content plans and editorial calendar. That is the topic archaeology process: Keyword search volume, plus social chatter volume, and a ranking score to deliver a data-driven, prioritized list of topics based on popularity. You can tweak this process based on tools at your disposal or tweak the spreadsheet if you find joy in such things. Just remember: It’s a relative comparison model, so be consistent across setting and scoring. If you are not an Excel expert and this paralyzes you in fear, don’t worry. This doesn’t require any deep Excel skill—it’s just a text edit, cut-and-paste into every cell in column J, and make the identical edit to the formula in each cell of column K.
You now have everything you need to shake up your editorial calendar with fresh content ideas. Armed with this data-driven list of topics, you’ll be better equipped than ever to capture your audience’s interest. Download your copy of our topic archaeology worksheet here to get started.